Behind every great poker player there’s a loving mom encouraging her wannabe poker pro to give up their day job and dedicate themselves to perfecting the game of poker. Not! 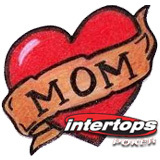 But even if not every mom is thrilled by their poker playing offspring’s passion for cards, Intertops Poker is celebrating motherhood with three special Mother’s Day poker tournaments and a 50% up to $300 reload bonus this weekend. Players can access these and dozens of other tournaments this weekend via the Tournaments tab at Intertops Poker. This weekend players can receive a 50% bonus up to $300 by claiming the Mother’s Day Reload Bonus. To get 50% extra on deposits made Thursday, May 10th to Sunday May 13th (only) players should enter the bonus code “MDAY2012” after clicking the Bonus Code button at the Intertops cashier. Assistance is available by clicking the Live Help button at any time. Intertops’ complete daily poker tournament schedule, including weekly Sunday $25,000 GTD tournaments the $40,000 Diamond Mine Tournament Series starting May 15th, is listed at http://poker.intertops.eu/en/tournaments/. Information on $10K Main Event satellites and the Side Event $56 Tournament is available at http://poker.intertops.eu/en/promotions/. By far the most popular poker site on the Cake Poker Network, Intertops Poker has been one of the world’s most established and trusted online poker rooms for nearly ten years.